Propped up & waiting for repair on Main Street. Being in the former DDR (East Germany) is always a little depressing. Despite the massive infusions from the old West Germany into the infrastructure and direct cash payments to all former DDR citizens, it still looks a little sorry. There were suddenly more abandoned buildings and more that looked like they never had been good structures. The newly built and rebuilt major roads were spiffy and smooth but the local streets could be punishing from terrible warping, rolling and endless patching of asphalt surfaces with substandard roadbeds. Many of the newer gravel bike paths delivered a smoother and more comfortable ride than DDR secondary streets or sidewalks. 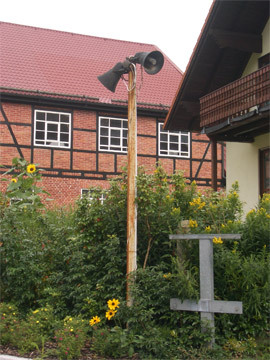 A typical eastern remnant: public speakers. The excellent-value and pleasant rooms we had been renting for the night in Austria and southern Germany gave way to overpriced and make-shift feeling abodes as we entered the former eastern Germany region. The rooms were always a little bit of a surprise with sinks that gurgled up water when you flushed the nearby toilet; too much too cheap furniture packed in a small space; and furnishing colors and fabric patterns that looked like they came from 3 very different decorating sprees. These were not the charming, tastefully decorated spaces that we came to expect elsewhere in Germany. And like in other parts of eastern Europe, more of the citizens had a down trodden look, which was especially disappointing to see in the young adults. We again noticed that odd "barely there" affect we have come to associate with being farther east in Europe--people who hang back in the doorways. One host who was pleasant enough had quite the knack for suddenly appearing and motionlessly listening to us talk. His approach was silent and he made no ripple in stillness; the only way we knew he had arrived was if we saw him standing behind us. His innocent but stealthy manner and his neglecting to mention he spoke some English had us wondering if these weren't useful habits formed in the old DDR days when a high percentage of the population were part-time spies for the repressive government. 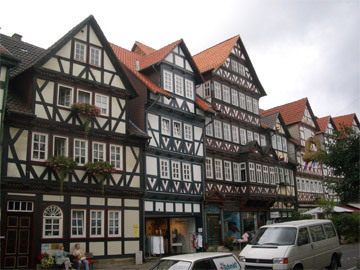 The always-head turning fachwerk buildings. Our travels, both in and out the the old DDR, became a matter of only pedaling day after day, which is what many bike travelers do. We however are accustomed to lacing our touring with visits to museums, historical sites, and the odd industrial venue. But there wasn't much to see that interested us along the route. We dutifully visited what looked like the best of a series of restored palaces, though furnishings of the formerly rich and famous aren't a big draw for us. 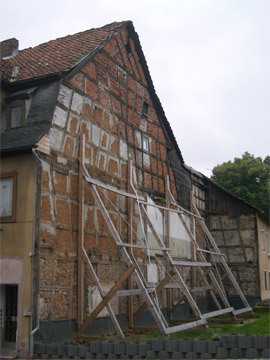 We meandered through many a village and appreciated eyefuls of distinctive "fachwerk" architecture--half timbered buildings with waddle and daub. It was pleasant though not grand cycling on the network of bike paths so common in Germany. Following the routes was like being on a scavenger hunt as you never knew what you'd find next. Sometimes we'd be flying along on smooth, dedicated bike paths next to a river or through a farmer's field, other times we'd feel like fools following the winding route up steep gravel paths that seemed to wander aimlessly through deep woods. Some of the paths were high quality ones with fine gravel, other times the route was on punishingly warped and deformed cobble or asphalt speckled with too many patches. One day we were riding upstream against the flow of triathletes on the biking leg of their event, another day the local brewery had hired a band and was passing out free beer in a town we rolled through. A few horses, cows or sheep here and there gave us something animate to admire, as did the rare swan, heron or stork. 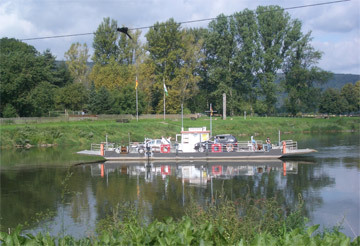 Car & pedestrian ferries were more common than bridges. As we rolled up and down the hills and made the right angled turns through farmer's fields and cruised through charming villages, we noticed the sights that are so typically German to us. The "sportsplatz" are often on the bike routes as they invariably can be reached safely by children on bikes. There we usually saw lush green sports fields for soccer and perhaps tennis courts or sand-outfitted beach volley areas. Equally common and less endearing were the freestanding cigarette vending machines that were conveniently placed on the corners in neighborhoods. And it didn't take a very large community to support a separate "Getränkemart" or "drink market" where people were seen carting out their favorite beers or other beverages by the case. Some hauled their booty off in the backs of their cars, others used bike trailers or specially designed hand wagons. 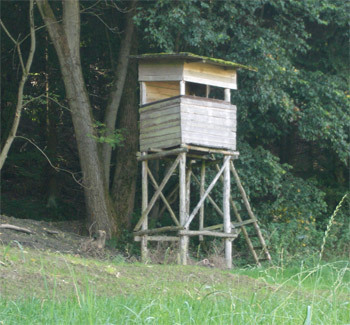 One of many "wild life management buildings." Many small villages prominently displayed their traditional Maypoles and in southern Germany men in leather shorts or Lederhosen were an everyday sight, especially on the weekends. Particularly in western Germany, we were often sharing the bike and walking trails with many very well mannered dogs out for a stroll with their folks. Late in September the U-cut flower gardens with a box for payment were down to their last blooms. The farther west we got in Germany, the more often people were stopping to offer directional help when we were paused beneath bike route signs. Wild boars aren't something I ever thought about before traveling and not something I knew much about either. But all that has changed, largely from traveling in Germany. If one is dining in restaurants, "Eber" is a necessary word for reading the meat selections on the menus. And then there are those odd huts sprinkled around farmers fields that Bill euphemistically termed "Wildlife management buildings"--hunting blinds that farmers use to reduce the numbers of boars ravaging their fields. We've admired a dozen or so penned boars snoozing and munching adjacent to a wooded bike path and we've had the misfortune of hearing squealing boars that were being chased by dogs on forest paths and hoped to exit the area before we were caught in the cross fire. Boars and dogs are both an ancient and modern combination in Germany, as was depicted on a stone in Cologne's Roman museum and with a pairing of a blown glass boar and dog in the same museum. 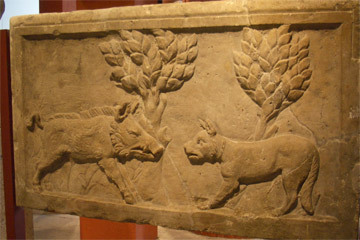 A Roman rendition of a boar & dog facing off. Even Mercedes-Benz had a TV commercial in 2006 that alternated between shots of a family of wild boar scampering through the forest with shots of their latest model. And I noticed a fine necktie with a boar motif in the window of an upscale hunters shop in Regensburg. Wild boars have been a part of life here for thousands of years and are one aspect of life that hasn't changed much. Yet another evening of studying the maps and guide books reinforced the experience during the day: riding north through central Germany was pleasant but too boring for our tastes. We needed to have something more to look forward to in the coming weeks than the highlights we were reading about: Hamburg's red light district-turned-tourist-destination; the Fairy Tale Road with villages featuring characters like the Pied Piper with white stenciled rats on the pavement marking the town tour; and one city with a worthy Egyptian collection that was in indefinite restoration due to water damage. Instead of heading north for a steady diet of pleasant riding for several more weeks before we flew home, we'd make a sharp left turn westwards towards the Düsseldorf area for another dose of Roman and Carolingian history and perhaps see some tributes to the more modern industrial giants in the steel and coal belt. A sure sign that we had made the right decision was the next morning Bill's laments shifted from "I don't know what we're going to do with all of our remaining time" to "We don't have enough time left." Bill also got a second boost as we left the DDR for the last time this year. Map Man hadn't planned on crossing the line into that drearier region and he was especially glad to be done with it. Nonetheless, being there was a good reminder of an important era of modern history and an era that still dramatically affects all of Germany today. 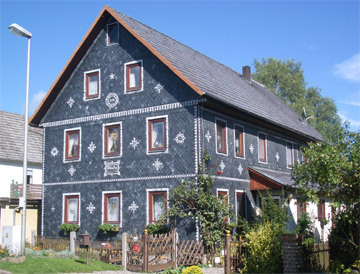 We only saw the gray slate siding on DDR houses. 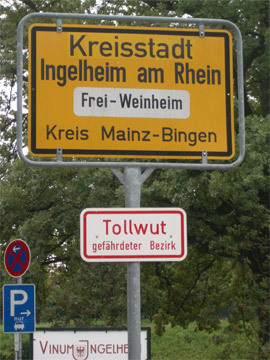 Moving north, even though it had been through the DDR, had been rewarding for Bill in that his spin on the German language became a better fit with the local speakers. Just as we struggle to comprehend what some native English speakers from other lands are saying, he and some Germans interact with little effective communication, but that changed for the better in central Germany. The decision to turn the corner and head west towards Düsseldorf began rewarding us before we arrived in the "Ruhrgebet" or industrial area of the Ruhr River valley. It wasn't big things that perked up our days, and perhaps it was just the improving weather, but there were little things that got the wheels in our heads spinning again. Observing the changes in the farm land had us pondering such things as the source of the sandy soil (glaciers or old seas?) in one pocket and the need for the development of the heavy plow around the 9th century to turn the denser soils in the next valley. And even when the hills that had been delivering almost 2,000' gain days disappeared to a little over 200' days, we were still intrigued. The flat, flat land with nothing else on the horizon had Bill commenting "That's why some northern European paintings are mostly sky" because sky is most of what there is to see. As we approached Dortmund, a city north of Düsseldorf, the industrial nature of the region became clear. In the late morning a memorial to one of the many coal mines that closed in the 1980's and 1990's was gracing a neighborhood bike route. At our canal-side lunch, we looked across the water to a coal loading operation that would have been filling barges if it hadn't been Sunday. A memorial to the now defunct coal mining industry. On the outskirts of Dortmund, we crossed a long bridge that spanned a huge rail yard, rather than water. But only 3 or 4 of the 30-some pairs of tracks were in use--all the others were abandoned. And we finished off the day by visiting an enormous museum dedicated to occupational safety that included such things as a defunct blast furnace as a part of its displays. There was no missing that this was the industrial heartland, unlike regions we recently traversed that were clinging to their legacy of fairy tales and regional cheeses. It was at Bochum that we were really immersed in the industrial past. 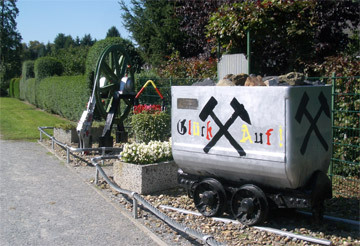 Its large mining museum focused on the regional coal mines, but also paid tribute to a diverse range of topics, including 5,000 year old English flint mining operations and the bare-chested Japanese women working the coal mines of their country. The extensive display of mining lamps included the favorites of a number of different centuries and styles associated with more than a half dozen types of fuel, including several open-flame models attached to fabric hats. The man selling tickets at Bochum's mining museum was astounded when we left just before closing, noting we'd been there almost 7 hours. He said 2 hours was average, with 1 school group setting the record at 7 minutes. It was the variety of topics and the creative presentations that kept us happily plugging away at the exhibits. The museum had an unusual number of quality models comparing working conditions in the shafts in different eras and room-sized models of the hundreds of miles of tunnels in mining operations. There were models that moved when you pushed the button and an underground walk-through model of a coal mine. And we took our turn feeling the jostling from a compressed air hammer. The next day Bill identified a neighborhood in a nearby town of Bottrop as an old mining company's housing development--a neighborhood of 2, 4, and 6-plexes that looked exactly like a model neighborhood we'd seen in the museum. I'd scoffed at the museum models as being too incredible because the houses were so big and the yards so spacious but there they were--gracious, tree-lined neighborhoods that we'd be happy to move into today. One of the many mountains of mining tailings. We soon learned that the occasional interruptions in the very flat terrain were all human made--they were unimaginably huge slag and mining tailing heaps, some covered with vegetation. We ultimately felt a little silly in our decision to visit the Tetraeder observation tower at Bottrop built upon a slag heap. It sounded more intriguing in the guide book than it was in person. We dutifully walked to the top of the open structure to admire the industrial panorama. Plaques that in other settings would name surrounding peaks in each direction were naming church steeples, other slag heaps, and smoke stacks--the tallest structures on the horizon. These slag heaps were the only disruptions to the flat plains in each direction and were so huge that they appeared natural. The one we biked to the top of was somewhat terraced and completely covered with a deciduous forest. One of the most ironic sights from the peculiar observation tower was that of a few wind turbines (modern wind mills) churning away on this land honeycombed with coal mines deep below. We noted other monuments to the past as we crisscrossed the Industrial Heritage Route posted for hundreds of miles through Germany, a route for those motorists wanting to take in the best of the country's former industrial might. 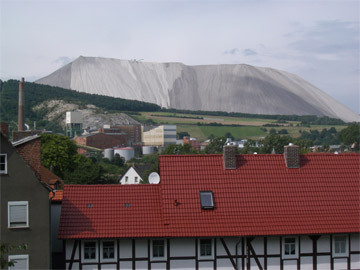 One novelty was a mile-long indoor ski slope that's open year round that was built down the side of another giant slag heap. Elsewhere, defunct blast furnaces now served as outdoor climbing walls and huge storage tanks have been reinvented as entertainment centers on the inside and observation towers on the outside. Not a lot that we saw in the Ruhrgebeit was pretty, but it had made for the interesting look back at modern history that we had hoped it would be. Traveling a little farther west would quickly shift the focus to higher culture. 14th c northern expressionism in wood. A special detour for Bill was to Aachen near the French border which was the seat of the Carolingian empire, with 30 medieval German kings spanning 600 years being crowned there. Like many of our historical site pilgrimages, there wasn't a lot to see but we admired the chapel that Charlemagne had built and which was patterned after a church in Ravenna, Italy we had seen. The stop-over in Cologne served both of us: Bill wanted to revisit its gothic cathedral that wasn't finished until the late 1800's and I longed for a second chance at their Roman museum. We visited Cologne in 2001, our first year of travel, and were curious if they would still be impressive sights now that we've seen so much more. Predictably, they didn't dazzle as much the second time. Armed with a broader background I could now see that the museum's displays were so chronologically muddled that one could easily leave with some very false impressions but that their display of Roman glass was indeed exceptional. 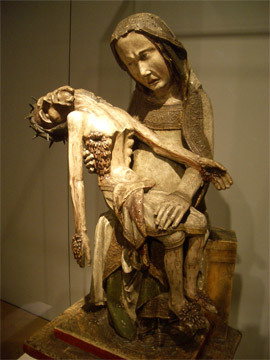 We dashed into one of Bonn's many fine museums to see a particularly ugly but historically significant pieta from 1360 that we'd learned about from our art history DVD lectures. It was indeed as horrific as we'd remembered it but it was also much more richly detailed than was evident on our small screen. But it was the temporary exhibit on evolution that derailed what was intended as a quick visit to the museum. The English audio guide was a terrific accompaniment to the exhibit and continued a trend of the best evolution exhibits that we've seen being the temporary or traveling ones. We were lucky to have good weather as we rode the prettiest stretch of the Rhine River between Koblenz and Bingen for a second time in our 6 years of travel. Our pleasure was amplified by doing the route on the weekend as we were joined by hundreds of other cyclists on the paths. I always savor the festive air on busy German bike routes--it's like being at an outdoor party. And I felt like I'd bumped into an old friend when we happened upon a crane from middle of 1500's that we'd seen before. I however had forgotten the amazing story that it was used until 1911, primarily for loading massive mill stones onto river barges. But seeing the crane also signaled we were approaching Frankfurt, approaching the end of our traveling season. It was a time for looking back on the year and looking forward to being at home briefly and then heading off to New Zealand. 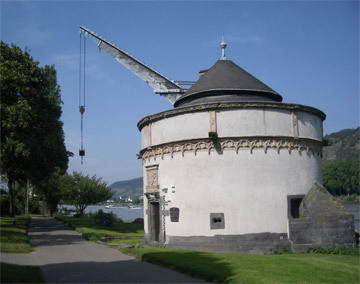 16th c crane on the Rhine for loading mill stones. As we enjoyed the improving September weather and the increasingly more interesting sights, we reflected on the traveling season. We knew that our travels in 2006 wouldn't be chocked full of oh's and ah's as there weren't many new or edgy lands on our itinerary. Our aborted attempt to go to Australia at the end of last year and our second effort at the end of this year had made for a shorter season and a tighter loop as we picked up some missed opportunities in familiar countries. And predictably, the educational experiences hadn't been as intense as previous years as we visited new sites for old friends, the Celts and the Romans, among others. Not being challenged by so much that is new had us looking at the finer details of that which was more familiar. We lamented that we hadn't applied ourselves this year to advancing our knowledge of trees, but the coming of fall made a review course compelling. Hearing the crunching of horse chestnut casings under our wheels or seeing acorns from several kinds of oaks on the asphalt cued us to look up and admire the source. Bright berries replaced blooms as the main source of color before the leaves began to turn. The compact clusters of almost black elder berries; the leathery red fruits of hawthorn, Rowan and roses; the orange clumps on a rare sea buckthorn; and the beckoning translucent red berries of the Guelder rose all turned our heads and had us confirming their names in our buried tree book. The only tree added to our list this year was the medlar, with its vaguely-apple like fruit that was brought to Europe from Persia by the Romans. We were thrilled to see a couple more Indian bean trees with their long dangling seed pods and the horn beams with their elongated strand of papery seed containers. The weather was sooo much kinder to us in September than in August. We had a couple of days with rain in September instead of the couple without in August; a few hot days in the mid-80's; a couple of windy days; a couple of cool foggy days--all together a much more comfortable mix. But the strong winds, crosswinds begging to be headwinds, reminded us that we weren't clearing the storm systems by much. Dust: it was an odd nuisance to encounter in the middle of September after coping with the mud and rain of August. Instead, now our bikes and gear were slowly acquiring a patina of dust from all the miles of trail riding. We weren't being coated by overtly dusty paths that billowed clouds of dust, but instead it was the cumulative effect of riding on unusually bone-dry dirt paths that were interspersed with the gravel and asphalt stretches of the routes. Once in Frankfurt, we were forced to shift from reminiscing about the year to turning our heads seriously towards the ever-changing world of flying. The airline terrorism plot foiled by the Brits this summer made for a noticeable increase in security for our September departure from the Frankfurt. For the first time, even barely-there sandals like ours had to come off for scanning and everybody got a thorough but highly professional pat-down. Our luggage was scrutinized more carefully in the scanners than ever before but despite having a provocative electric cook pot and masses of metal in the form of bike locks and aerobars, our bags weren't pulled aside and unpacked--whew!. The new "No gels, creams, pastes, liquids" rule created some challenges, especially since we checked our bikes and bags the night before. That meant leaving out a dab of toothpaste on a piece of plastic wrap for the bedtime and morning routine as well as throwing away the unused portions of lotions and shampoos before leaving for the airport. We contemplated the environmental impact of so many products that were getting discarded instead of used because they couldn't go in carry-on. (Though the US is relaxing its policy on those items soon.). But we were pleasantly surprised that none of the fresh food items we planned to haul on board were confiscated in the gray area of the ban. And fortunately for us, the temporary ban on carry-on electronics didn't apply for our flight. The ban on carrying water combined with the increasingly longer security process puts one a risk of getting too dry--just what you aren't suppose to do before flying. I stashed an empty bottle in my carry-on, which I was asked about during the security scan and was allowed to keep. I intended to fill it in an airport bathroom but neglected to do so in the conveyor-belt process of the security searches. But as soon as we boarded, an obliging flight attendant filled it upon request. I was tipped off to that possibly on a previous flight where the attendant said that they couldn't give thirsty customers like me a bottle of water but could fill a customer's own bottle. Sure enough, the man filled my liter bottle about 2/3's full. It was especially nice as our flight was more than a half hour late in leaving and the meager beverage service was another hour off. We had a special treat on our daytime flight: clear weather over Greenland. It was 'noses to the glass' as we marveled at the glaciers that meandered right up to the ocean. It was a mini-review of some of our prior sightseeing. Almost every year of our travels we've had some glacier experience, including walking on and under Pasterze Glacier in Austria; admiring several in Iceland from both the land and water; and looking down on those near Mount Blanc from a cable car. The cable car view was of course the most similar and we eagerly pointed out the miles of cracks in the surface of the ice that is a marker of a moving glacier--cracks just like the ones we'd seen on Mont Blanc this year. Bill also noted that Greenland's blanket of white that was pierced by relatively few rocky points was what the Alps would have looked like in the last Ice Age. I am still stunned to think that the Alp's glaciers were thousands of feet thick and the sight of Greenland made a convincing argument. But anyway you cut it, 10 hours is a long time to sit on an airplane and we were glad to have the tiresome journey done. Bringing the bikes home is always a challenge and this year we planned to put them on the MAX light-rail line and pedal the last mile to Bill's sister's house. She was graciously meeting us at the airport and hauling our luggage, though the bikes wouldn't fit in her car. But instead we were taken aback to be met by both Bill's sister and our traveling friend Mulvey--the same fellow some of you have read about rendezvousing with us in Turkey and northern Italy. Mulvey brought his newly purchased station wagon ready to haul our bikes from the airport. That treat was topped off by being greeted by sunny skies instead of the expected rain. Our stay in Portland was off to a grand start. "What were the highlights of the year?" That's easy. As expected, the planned, non-biking prelude to Egypt took the prize for being the most startling, the most unusual, the most interesting destination. Going to the Siwa Oasis was especially captivating, not always in a positive way. Corsica was the winner in the "Best cyclotouring in a new region" category. Going to Corsica was unplanned and even more unexpected was how delightful it was, especially in the north. Biking in the Dolomites continues to be a wondrous experience that we will happily repeat again and again. And doing several hikes along the Vie Ferrata routes in the Dolomites added an exciting new dimension to savoring our time in the mountains and pushing our edges. The highest point we experienced in 2006 (and that's available in Europe): Mont Blanc, France at 12,600' attained by cable car from Italy. The lowest point: Siwa Oasis, Egypt at 40' below sea level, accessed by bus and donkey cart. In the technical arena, the big surprise and disappointment was having our spokes start pulling out of our rims not once but twice. We bought new wheels at the beginning of our season when we discovered the damage after recovering our bikes from a storage unit in Florence, Italy. It was only a few months later that we discovered that our new spokes were beginning to pop out of our new wheels. Egad, we'd ridden somewhere around 20,000 miles without that happening and suddenly it seemed like a contagion. Biggest surprise: Was the good news even closer to the pavement, which was completing a second (though short) cycling season on 1 set of tires, and without a flat on any of our 4 tires. After our favorite tires were discontinued in 2003, we rode on the dismissal new models that had us, at the worst, patching several flats a day. In 2005 we hauled 4 heavy German-made Schwalbe tires back to Barcelona with us as they weren't available in Spain, and we are still riding on them. We feel a tad silly carrying 2 pumps, a spare tire, a spare tube, and a repair kit when we've doing nothing to the tires but top-off the air level since about April of 2005. Biggest disappointment: That honor goes to an August in which it rained almost every day. We had wondered how we'd endure the August heat given the record breaking heat wave that melted much of Germany in July but it never materialized. Biggest relief: That the bird flu pandemic didn't strike. We briefly wondered if we should be traveling at all in 2006 as at the outset the scourge looked inevitable as we departed the States. And alas, we were sorry to hear the experts surmise that terrorism will likely to continue to be a significant issue for the remainder of our lives. The biggest things in the smallest packages: M3P player + tiny speakers + a guided imagery CD = sleep each night like we've never known as adults. Ah, it must be adding years to our lives. Another surprise that unfolded over the months was Bill's success with dropping his weight down to that of his teenage years--something he didn't think possible. My most frightening experiences in 2006 weren't out on the streets mixing it up with trucks or dodging crazy people, this year it was getting trapped in small spaces in hotels. The first was getting stuck in an elevator--everyone's nightmare and my first experience with it. I immediately noticed the lack of ventilation on the already warm day and both the staff and I were startled to discover that their emergency key didn't pop the door open. I finally asked for a knife, which they produced without question and passed through a crack they wedged between the stuck doors. Bill knew what I was doing: cutting off the books taped on the front of his bike that was jamming the door. The slightly turned front wheel could then move the critical 1/4" away from the interior of the elevator doors, releasing enough pressure to allow the door system to function normally. The experience made for weeks of jokes about "Barb slashing her way out of an elevator." Our second experience was when we were both on the same side of a basement bike room door that unexpectedly slammed closed in the course of fumbling in the dark after the light on a timer had gone out. It was an odd arrangement in that the door could not be opened from the inside (no turning knob, no keyed latch). After some fruitless calls for help through the hole where the second lock used to be and wondering how many hours we'd be stuck, we discovered a second, less apparent, door behind us. Some people aren't cut out for the hospitality industry. One B&B hostess's list of "Thou shalt not" was getting too long. "Don't let the bikes touch the house exterior." "Don't touch the walls in the halls or the room." "Don't wash your clothes." Don't turn the shower water completely on." She missed "Don't cook in the room." And the annoyances continued. The room had a refrigerator, but the special cord was missing. Clever Bill however recognized that it matched one of our cords. All the wires and cables were there for the TV, but the TV was missing. And the last straw was discovering our unusually meager number of towels had all been snipped in half. The surprise was that she did provide us with an amble supply of toilet paper, which left us wondering who had successfully lectured her on that point. Who would have guessed rabies was the issue. At lunch one day we causally looked up "Tollwut" in Bill's handy electronic dictionary and were shocked to discover that the red and white sign we had seen was a warning about rabies in the immediate area. Lodging expenses for a pleasant room with a private bath ranged from over 100€ in Switzerland (which we declined to pay) to 35€ in Austria and southern Germany. Northern Italy was usually about 70-75€ per night for 2 whereas we often spent about 50€ per night in Corsica. (Commonly in 2006 1 € = $1.28). And surprisingly, the 35€ rooms in Austria and southern Germany were some of our best appointed and most comfortable for the year with private balconies, satellite TV, and perhaps use of a refrigerator or hot pot and dishes. If breakfast was included with the room price and we could opt out with a reduction in our room rate, we could sometimes pay for our entire day's groceries with the difference. The savings ranged from 5-18€ for 2 people. Our daily expenses at the grocery store for the 2 of us were often in the 10-15€ , largely varying with the cost of produce. For that price we were meeting our daily calorie intake when dieting and riding of up to 2700 calories each. Our fastest pedaling rate on loaded bikes on the flat river routes was just under 20 mph, which we only sustained for short intervals. When grinding up a steep grade, the speedometer was often just over 2 mph. A snappy average speed for the day on a flat river route in Germany was a little over 12 mph; on a big climbing day it might be under 6 mph. We tracked our climbing rate as we clawed our way up several Swiss Alp passes and it was surprisingly consistent. We accumulated 500 meters of gain in about 90 minutes, or about 1640', including time for brief rests. That was a little under 20'/minute. Most of those climbs were predominately 7-8% grades in uncomfortably warm weather. We were surprised that we were probably at our most efficient on those grades as on lesser, sustained grades our speed didn't increase enough to improve our average rate of gain. Our biggest elevation gain days were around 5,000', both in the western Alps, in or near Switzerland. On an average day out of the mountains, we would often accumulate about 1,000' in gain. We generally averaged a little over 600 miles per month, including taking days off for sightseeing. We did have some big weeks, like one zippy week in Germany where we racked up about 250 miles. The miles riding per day varied wildly and depended on the weather, the terrain, and stops for museum visits. What felt like a ridiculously short riding day with planned sightseeing was 11 miles; an equally rare day would be over 50 miles. We suspect our loaded bikes exceeded the 110-120 lb range that we had estimated in 2005, perhaps by 10 pounds. That wraps up the European leg of our 2006 traveling and cycling season. After a 5 week stay in Portland, we headed out for 4 months in New Zealand at the beginning of November. We wonder what that will be like. We wonder if the absence of a heavy dose of ancient history and the lack of challenges to advance our language studies will detract from our pleasure. Everyone who has been there raves about how beautiful New Zealand is, so we'll take our new hiking boots and hope to be thrilled by the experience. It will be summer there, so perhaps the weather gods will be good to us.